León’s Association of Technology Companies rewards the initiative of people and companies leading projects which are fostering the economic and technological development of our province. Last night, Aletic celebrated the second edition of the awards that bear its name in a bid to defend the interests of the companies related to technology and the computing sector. The ceremony started with the speech by the mayor of León, Antonio Silván. After his speech, Pablo Peláez, CEO of Plain Concepts, highlighted in his talk “León, cradle for technology” the importance of talent. For him, “there is a need to invest in talent, not only looking for it; if you generate it in your own city, this will encourage companies to come to León”. The first participants who received the award were the students of the Integrated Vocational Training School CIFP Virgen del Buen Suceso for their project Mochila Inteligente Systems Intelligent Lionin the category of Young Talent. These young researchers opt for a type of technological development in the service of society. For them, this bet creates value, and “we all should push for the province’s young people to have a future”. They stated that there is a great deal of talent in the province, “we only need to believe in it and promote it”. The award for the project Innovating for León was to El Bierzo region, more specifically to Miguel Martínez, chef and owner of the restaurant La Tronera. He received this award for his project Botillo 2.0., handed by Juan Martínez Majo, president of the Provincial Council of León. The award for the Best Innovative ICT Company was to Hilo Verde Innovaciónfor its project “Hilo Verde Conecta: transformando el conocimiento en calidad rentabilidad” (“Green Thread Connects: transforming knowledge into quality efficiency”. Verónica Verdejo, who collected the award, talked about entrepreneurship. She stressed that starting up a new business “is possible and necessary”. On behalf of its team, she asserted that “they advocate for a low-cost technology that is accessible to everyone”. Before the night’s main award, Francisco Pérez Bes, Secretary-General of INCIBE, gave his speech. Besides updating the attendees about the role and latest developments of INCIBE, Francisco seized the opportunity to talk about ENISE, the International Meeting on Information Security in which León UP will participate with a stand of León’s City Council. The stand aims to inform about what are the advantages offered by the city of León to cybersecurity companies. The last award was to Pilar López Álvarez, President of Microsoft España, who comes from León and received the award for Talent and Leadership. In her speech she presented what she and her company think are the three keys to leadership: being clear, generating energy and ensuring success. To talk about talent, she quoted the English writer Doris Lessing, who stated that “talent is something quite ordinary. It is not intelligence that is scarce, but perseverance”. 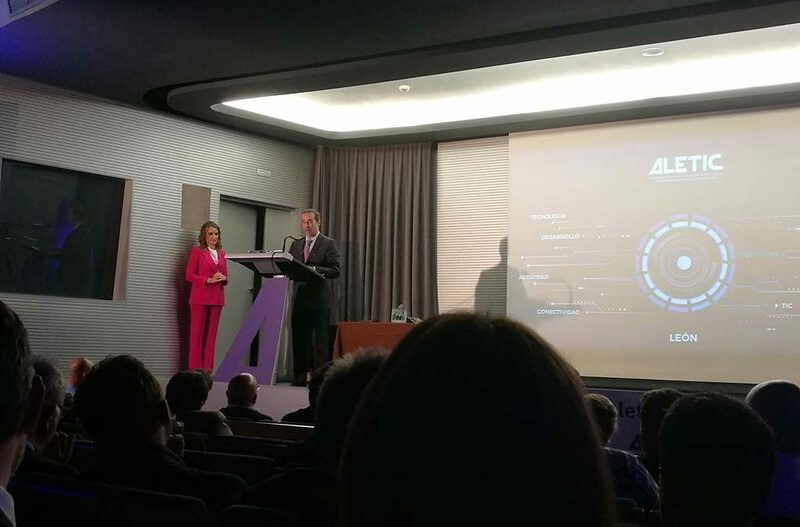 The event ended with the speech on ICTs, Talent and Innovation by María Victoria Seco Fernández, Director-General for Telecommunications of the Castilla y León Council and the participation of Lucio Fuertes Soto, President of Aletic. Aletic works for the development of activities closely related to the technology and computing sector in León and the rest of the autonomous community. It was born in 2004 with this goal, in which it still believes under its motto “The more of us, the more we will grow”.